For the professional wrestler, see Jimmy Olsen (wrestler). DC Comics has reported in solicits[when?] that Nick Spencer and R.B. 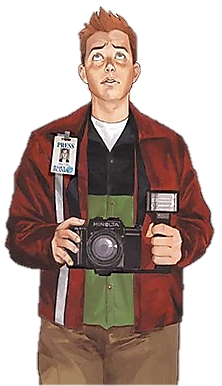 Silva will be producing a monthly 10-page backup feature in Action Comics chronicling the adventures of Jimmy Olsen in Metropolis. Reported story topics include an alien civilization choosing Metropolis as the base of a major cultural celebration, and the introduction of Chloe Sullivan (from the Smallville television series) to the DCU proper. In the latest arc, he goes on a charity date with a girl named Maggie, only to discover that she somehow has ties to Mr. Mxyzptlk, and that she wants to marry him.